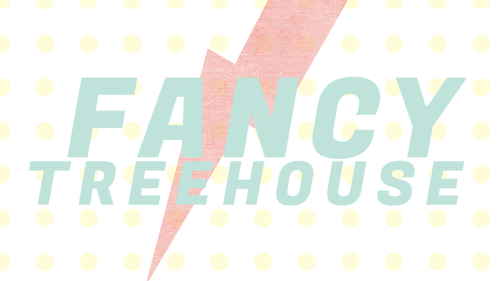 Fancy Treehouse. : Leave out the others, baby. Say I'm the only one. Leave out the others, baby. Say I'm the only one. Hi guys! I'm kinda sad because I want to give everyone the flower crown. I need to make like 50 and give them all away. I'll try! But I definitely have a lot more things to give away and I will do so! I'm excited today because I got this lighting necklace for free on Gilt with a credit I had on there. For some reason, free things are so fun to me that I could just burst! They probably are to everyone but I wonder if anyone else gets so excited that they get a shaky feeling? I think I get that a lot though..actually I can count about 10 times I had it just today...so nevermind. Well, fine, if you're going to beat it out of me, I'll tell you! 1. When Gabe brought me my Americano this morning (drink of the moment that I crave all day and I can't wait to go to bed tonight so I can wake up and drink one). 2. When Gabe brought me a bag of my favorite Sea Salt Caramels. 3. When I got an email letting me know one of my Christmas gifts had shipped. 4. When I listened to Pete Yorn's Music for the Morning After. 5. When one of my favorite Belle and Sebastian songs came on during this terrible movie I was watching on Instant Netflix. 6. When Birdie met a new Pug friend named Lucy at the dog park and had the best time of her life playing with her. 7. When my necklace came. So this is my comfy Saturday outfit. The thing about tights is, you just have to get used to them. They aren't that uncomfortable and they sure beat being cold. These are definitely on my wish list right now! LOVE your sweater! the tights are fab too! i adore your floral shirt & lacey sweater combo, lovely!! Agree, the sweater is so fab, super cute with the flowery collar that sticks out...I also think that your clock looks like a really nice one, is it vintage? Lovely and sweet look. Again amazing photos! ok then i'll be on the lookout. and i listened to pete yorn a lot before. remember buying the cd one day before 9/11. but then i only started listening on the night of 9/11- and a lot of the background sounds makes me think of that day. I really enjoy this look of yours. Your shoes are very pretty, but the thing i like the most is definitely your sweater and necklace. It seems really comfy! you should check out whichgoose on etsy. she makes incredibly beautiful flowery crowns! I have one and people compliment it whenever i where it! 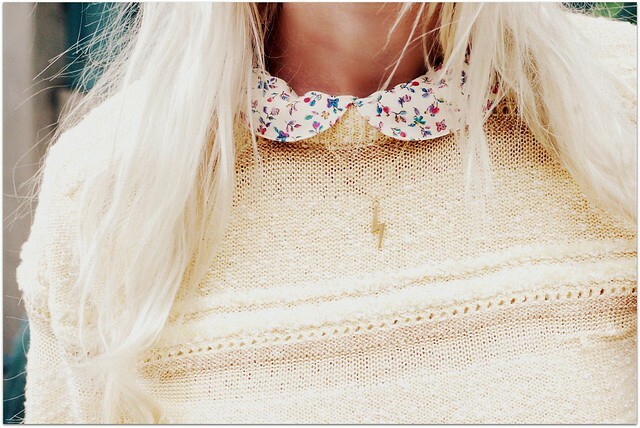 I like the peter pan collar over the sweater! Tights and shorts are my favorite combo for southern california winters! I adore your flower crowns like you don't even know! 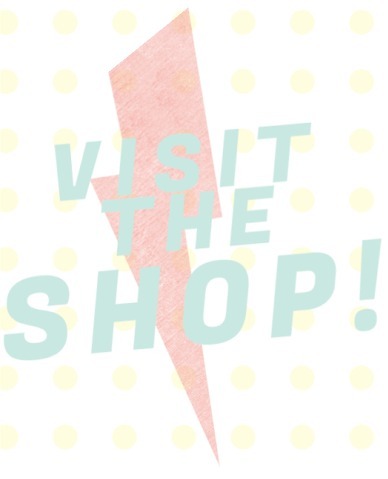 I've just found your blog and I must say that it is adorable :) Oh,and the shoes are perfect. you're so lucky that's your climate you have no idea! i dream of wearing shorts again (not for another 4 months! AAAAARGH!) great outfit! I LOVE outfit! So cute, make me wish I could wear it...too cold here! Aw I love those tights, I always forget about my pair! one of my friends has a pug named Lucy! her owner wouldn't happen to have been named Jeremy, would he? haha. you look so lovely, as always! Wow, what a wonderful outfit! So simple, so girly! Loved it!! Added your blog to my favs. I like people with good taste lol. your post inspires me to chop off a pair of jeans i don't wear anymore to make cut-offs for over tights. really adorable with loafers. i love the 1960's flower child cali girl style you have. it really is amazing and inspiring! those vintage levi shorts are a really good find! I adore the whole outfit, especially the shoes and jumper. Great pictures! Totally dig this! You look so cute! I just found your blog and... wow! :) All your outfits are so amazing. I love that sweet little collar peeking out, that sweater and your beautiful coat! You look wonderful. PS. I get that feeling ALL THE TIME. Especially times involving free stuff. I adore ur style:) I'm a big fan of you ! I love everything about this outfit! I just started following your blog and am loving it! Those loafers are so unique! I think my favourite part of this outfit is the tiny peek of pretty floral blouse. So cute! You are always lovely, but i'm in love with your heart tights.